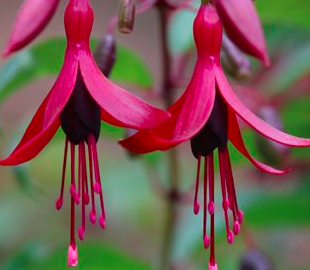 Striking hardy Fuchsia with stunning deeply hued flowers. Sepals are deep wine colored and a corolla of nearly black fading a bit upon opening to deep maroon. Very floriferous Fuchsia with masses of small flowers over a bushy upright growing sub-shrub. To 3′ x 3′ in rich, well drained soil in part shade. Regular summer water and give it a handful of all organic fertilizer in spring. Dies to the ground in very hard freezes and resprouts vigorously in mid-spring. Wonderful plant for borders, the edge of woodlands and even containers. Glossy foliage is very handsome too. Do not cut back until new growth emerges in spring- then you’ll know what is dead and what to remove. Very hardy variety.